All the reports I have from friends still hunting TBR this year and from what I saw yesterday while scouting with another TBH guy show that TBR is having many more deer sightings, bucks are broken off from bachelor groups, some sparring has begun, deer are being seen during the afternoon as well as early AM and late evening (bucks). Put an afternoon of scouting in to maximize your hunt before deciding on just one place or if time is going to be tight then stick to known areas youve had good experience in the past. All the usual places I saw deer at in the past are working very well again this season. Stick close to water sources in the AM and midday hunts, go to food sources in the evening. They are coming into the corn very well, especially "scented" corn (I spray mine with Apple juice) or scent up a perimeter around new baiting spots (yes its allowed here!) with some "Tails End" lure to bring them in. He called that night to tell me he had checked out one of the Northern Unit areas of San Angelo State Park permit hunting spots along FM2288 and the river was basically dry and there were several people hunting that area it seems. The Best "Puddle" of water in the river bed had someone already set-up on it (after 1/2 mile hike in) and there was about 4 groups of out of town hunters in the North end camp ground. So basically its crowded with no deer (or very slim due to no water) cause they probably have moved across the Hwy into the main park which is a special draw hunt ONLY area. Hunting pressure in some areas of TBR has been VERY low and non-existent in some areas if ya get way back in. As always avoid Unit 2 its the heaviest pressured area and a favorite of the local military base guys. We have done some more research on this, and after some GPS estimates yesterday while scouting we have figured it to be very close to about 15,000 ACRES at TBR. State park is only 2,100 acres, and the U.S. Dept. of the Interior is the governing agency of this land. 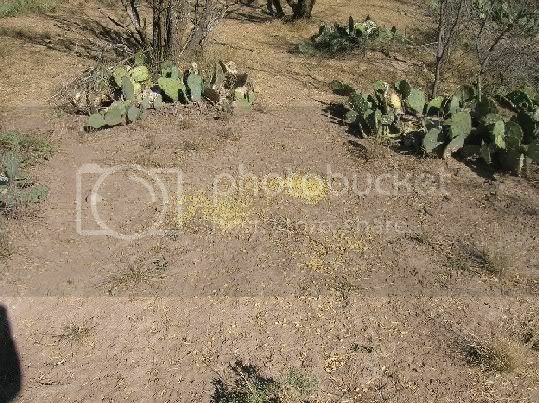 I can show ya the boundry markers on my ranch that mark public/private. I'm next to Unit 4 at TBR. Try this link here for the Map of TBR public hunting units. I tried to download here but the file is way to big. Last edited by SanAngeloBowman; 10-20-2008 at 08:51 PM. 3) Go to top of screen and clear OR highlight the address bar. This WILL work. I just tried it to make sure. I went to TBR unit 1 Saturday afternoon and set up on a trail leading to the river. About 5:15 some guys showed up on the west side of the river and started dove hunting. They shot until 6:30 and then cranked up the stereo and partied. I was set up at TBR unit 3 Sunday morning when two pick up trucks barrelled down the trail just before 8:00 and started making noise all around me. Lesson learned: go to TBR during the week when everyone else is at work. Thanks to SanAngeloBowman for his hospitality. Yes, always best to hunt Public Land during the week. I've got on deer every day since ya left (sorry ) and even shot a turkey today and had a porcupine charge me, so I had to shoot at him too. Thankfully I missed him cause I really didn't want to deal with pulling my arrow out of the pincushion. He was huge. Bigger than my black lab, so I don't know if that s normal cause its the first one I've seen in person (and up close ) the moon change and cooler temps sure has helped, sorry Rob. We'll get ya one next time. Like to make a point here....the area where those people were making noise across the river is the infamous Unit 2 that I always warn to avoid because of the heavy weekend traffic in there. It was unfortunate it happend while Arrowdynamic was in town, but since Dove season has closed things are MUCH quieter on weekends around here which is the norm. You made it over to Unit 5 yet? Just wondering how ya did. We have decent Turkey movement still around Unit 4 area. Not yet. It has to be family first, then hunting, ya know? When I get in there in the next couple of weeks, I'll post what I see. and if those birds are still in Unit 4,they must be finding some sort of fall forage to eat, and might hang around or return. I hope. I buried some sour corn last year in UNit 1 after opening a bag and didn't realize it had gone bad. I wasn't hunting hogs but within a couple days all 50# was dug up and gone. I wanted to actually try and actively hunt them this year, so just wondering if anyone could suggest an area around the lake to try first. Just got got back from there today and it is really slow.Didn't see as many deer as in years past and never saw any deer on my eveing hunts. So far, I've seen only does and little ones around Unit V. And armadillos. 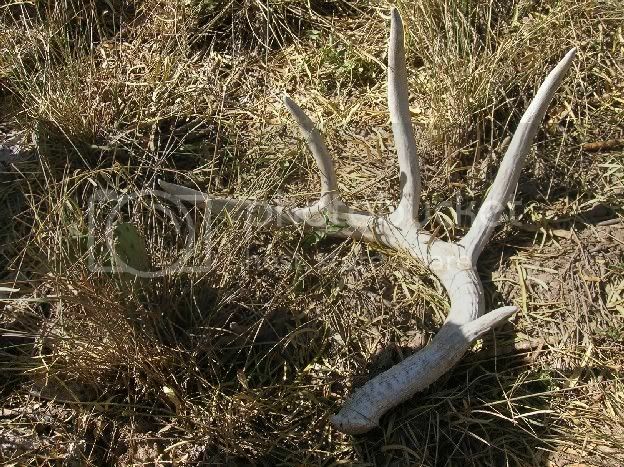 I drove down to El Dorado yesterday and saw two dead bucks on the side of the road, one a spike, the other looked bigger. so maybe there is some movement in spite of the heat? Stoney -- TBR is shotgun hunted. No slugs, just buck shot. But some others posting here say they have had slugs fired over their heads. So there you go. Unit 7is one of the most accessable areas and you can even drive a passanger car through there as a shortcut to get to "Gassy Meadows" (Middle Concho Park) I don't know anyone that hunts there (ever) plus the area around the dam/spillway is the designated 4x4 offroad park region and can get very busy on weekends. I wouldn't really waste my time around there. Go down the road to Unit 6 and go way back as far as you can reach or Unit 4 if you are on that side of the lake. Unit 1 is great but w/o someone to show you how to get into it and where to head once in there....you'll never find it. Can you quail hunt this place?? Is it open for spring turkey?? I used to quail hunt at the park a few years back. Never knew about TBR. Yes on Quail and Turkey. Deer movement has picked up quite a bit. Most of my deer have been coming in in the last 45 mins in the EVENING. Find the THICKEST cover closest to water and ya should do fine. Not much deer movement, and it looks pretty dry. I had to cut out early because my gf had a family emergency down in Houston. 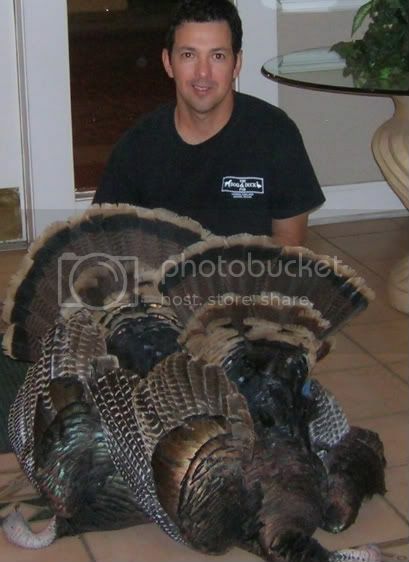 BUT not before I took a couple of nice gobblers for thanksgiving! I also found a whole bunch of baiting going on, bait buckets in the ground and in the trees and permanent blinds all over the place, and an ol' boy who drove over the fence, baited turkey, and left a bunch of pepsi bottles behind when he drove out. You would think there was deer, but IMO that unit is mostly fringe habitat -- not core territory, except for maybe right by the river. BTW: anyone who wants an abandoned double bull matrix blind, get over to the NW corner of this unit. It's been there since archery season, along with a hanging bucket feeder. I drove around Unit 1 and could NOT find any way in -- just exactly as San Angelo Bowman warned me I would. So next time I am there, I will definitely have to look you up, bro! Unit 2 was closed down due to human remains being found. This was my first time out to San Angelo, and I want to say y'all were super friendly awesome people and you have a great town! Hopefully I can get back before the general season is out. yA MAN, that'd be great. I been wanting to get out there anyway. I get tired of hunting my place all the time. Glad ya got ya some turkey's. I told ya there's tons of them. Which unit did you get those from? BAITING IS VERY MUCH LEGAL at TBR and leaving permanent blinds out there is acceptable too. There are tons of them out there. The Gravity (bucket) feeder thing is so popular around that lake that the deer won't come into the mechanical feeders nearly as much on our ranch, so a couple of us have gone to hanging buckets even on our LEASE and we see 10x as many deer as the other 2 guys. I knew baiting was OK at OC Fisher, but I guess I thought it was no-go at TBR. I stand corrected. I took those two toms in Unit V, and their crops were full of bait corn, green grass, and hoppers. I also forgot to mention someone is running a little herd of goats in that unit, so be careful if you are shooting in the twilight hours at what you think is a little doe. Does anyone have a link for information regarding hunting at Twin Buttes. What type of permit do I need? What are the dates? No permit is needed to hunt Twin Buttes. Just a hunting license. do you need a tag for hogs or just a hunting licences. In my experience hunting out at the "Buttes", which is what we always reffered to it as, I hunted deer, dove, ducks and quail. Not very successful with the quail. There is a bunch of them out there but they are wild and will not stay put when running dogs. We put the hurt on the duck population while I was there. We killed our fair share of dove as well. Best advice I could give is to hunt the back end of the place near the boys ranch, Unit V on the map. It is best to come in near the boys ranch as well. Its a rough ride and back then you would have to go out the boys ranch entrance anyway. I am sure if that has changed yet or not. I found that the hunting pressure was about half as much on the front side (near the dam). This was about two years ago and things probably have changed. Unit one is where I did most of my hunting because it was at the time not hunted but anyone but about 5 to 10 people that I knew of. Most of the turkeys I saw on the place were at the very back of the Unit 1 in the Pecan bottom. The neighbor had plowed up the field right across the fence and planted with oats and such. There was a bunch of deer movement in the back as well. You could also seal yourself off from the rest of the place and use your truck as a road block. Most people would not go by your truck but we had a few a-holes that did during prime time but its to be expected. We also had some encounters with Javi's near the boys ranch and in Unit 1 as well. A few were killed on the place while I was there. Good info Dustin, thanks for sharing. I believe you meant Unit 4 by the Boys Ranch (Check map at beginning of this thread) My ranch is at the end of that road (fm2166) Unit 5 is down the road off of hwy 67 just before the 12 mile bridge and is a walk-in only unit. Yes Unit 1 is awsome if ya get way back to where the pecan trees are (and the river splits) You have done your homework VERY few people I know even have found that spot. Most don't want to take there trucks through that really thick stuff that ya run into about halfway back on the way in, but the payoff is worth the trouble if you see the scrape lines through the trees just passed there before ya run back into the fence line again I'm sure you know where I'm talking about. NOW...here's the kicker(?) did ya know that they are done with that HUGE 12-15K sq ft hunting lodge thats off in the distance and boarders most of that Unit? Yep, and they are HIGH FENCING along that whole fenceline back there keeping all those big bucks that would bed down on the other side from coming into there traditional watering spots Only deer access will be from the dam area OR maybe way back as far as ya can go by the back fence next to the river. I don't think they own that stretch where the farm fields and cows are back there. May be they will fence out some of those nice deer into that small concentrated stretch back there eh? I filled half my tags back there last year and the year before. Last edited by SanAngeloBowman; 11-12-2008 at 04:22 PM. Didn't know about the high fence but I knew it was coming sooner or later. Yes I meant unit IV I just forgot the roman numberal. I will also let on a little secret of mine that I started hunting hard after sighting a 130 class coming over the dam every morning and afternoon. There is a stretch of land that is on the Buttes side of the dam that ranges from 100 yards wide then narrows down as it runs into the south pool. When I asked the game warden if this place was legal to hunt he said no. I am not sure if he knew exactly where I was talking about but he probably did. I am guessing there is an easement of some sort aquirred during construction and you are not allowed to hunt it. Atleast this was my understanding. Anyway, during constructin they dumped gravel over the the big rocks so the deer would have a quick access to the water. The EQ is only about waste deep in some areas and you can wade across and get to this piece of land. You don't have to set foot on the land just below the dam. Depending on the level of the lake there should be about 30 yards of dry, flooded (at times) timber, thick with some clearings and is heavily traveled by deer on their way to water. A little bit of hand corn will stop them just long enough for a shot. I killed two doe this way. I had the buck I was hunting within 10 yards looking at me head on so I never got a chance to draw. The best thing to do is use a boat because from experience it a chore to float a deer across the EQ and then drag it to your truck. sounds very interesting. I've seen many deer while kayaking down river FROM Garner dam towards South Pool on the EAST side river as well. Look at the map and it's that little thin strip between the river and that thin inlet. Is that where you are talking about? Maybe I'm confused (I've been doing homework this AM, brain hurts ) Or are ya talking about that area east of the dam and between the fence line on your way in before ya come to the end of the dam? I know THAT area is NOT supposed to be hunted but there are several people that DO bowhunt it and the GW seems to not enforce it. I've ran up on many deer at all times of day there on my way out but never hunted it myself. Unless you had a map in hand you would never know it was not part of the hunting boundry anyway. We oughta get together sometime when your in town and go cruise around out there. You're the only other person I've come across that seems to REALLY know the in's n outs of Unit 1. BTW....all that land by the Boys Ranch next to Unit 4 right where it says FM2166 on the map (kinda hexagon shaped with long point stickin' out right side) is my deer lease. Last edited by SanAngeloBowman; 11-13-2008 at 11:47 AM. I was Hafernick's running buddy most of the time out at "the Buttes". He was with me the day we discovered Unit 1. I remember the day like it was yesterday. We got stuck near the back and Hafernick had to be back at tract practice in an hour or less. Good times for sure out there. The ranch that borders Unit 1 was sold a few years ago while I was still out there. Its about 2000 acres and has quite a bit of frontage on 277 on the way to Christoval. I'd like to get back up there to see the big hunting lodge you speak of. We rattled a few bucks off that place but nothing to get a shot on and worth jumping the fence for. I'd like to find a painting of the Buttes to hang in my office so I can be reminded of the memories everyday! Best time of my life was spent in Angelo with Hafernick and ASU buddies. Is there a story behind this? I've hunted out there for several years and where I frequented I knew the other 2 hunters that were regulars and my other spot I only saw 2 guys besides me the entire season and they were from outta state and used to be stationed here years back after they moved away. Beisdes that I always expect it to be a little busier the first 2wks of the season then it always dies down. I am planig a trip out there at the end of the month. Well, really it depends on WHERE you go. I was up on the Dove Creek stretch last year and the ATVs were relentless, but I didn't notice any being heeled. Haven't even gone out there this year. Out at 12 mile I've had buckshot pass within close proximity (I could feel the vibration and hear the buzz) and a friend of mine had a run in with a couple guys, one packing an assault shotgun, the other a glock; in the archery season. I've only taken 2 deer out of there in the years I've hunted it, but at least its hunting. My brother inlaw, still at 12 mile, had a pellet strike the fence post where he was crossing. He hit the ground in a defensive posture. We decided that was about enough. I've seen quite a few quail hunters out there too. Which is fine, but their dogs tend to shut the deer movement down. Deer movement with the full moon has been slow in the EVENINGS. Rattling for me didn't produce anything, YET, but scent lures continue to work pretty well. Saturday morning we put 2 deer down. Nothing big though to speak of. Just meat in the freezer. I did see one good size little 125 buck around mid-morning. I have an invitation to go hunting at TBR after Thanksgiving, but I have heard the City Park Patrol is enforcing the obscure TXDOT rule for a safety certificate for ATV riders and threaten a $500 fine. Parks and Wildlife only require the ATV be registered. I live in East Texas and before I make the trip would appreaciate some insight on the matter. Thanks. Our local Park Police are jerks and love to hassle people. If you access hunting areas that do not have a public park as the main entrance then you should be fine. Cindy the local game warden will not hassle you at all. so you can enter at pretty much any Unit except the main Twin Buttes Reservoir/camp ground off hwy 67 without getting any hassle, and even then I bet they are only checking the guys using the Off-road trail section parking lot anyway. Ask whoever told ya this info where they were when asked to the ATV CERT. Also like to apologize for us having such idiots for Park Police. They have been doing MUCH more harm than good around here the last couple years harrassing visitors and locals alike around our county parks and lakes. During the past summer they did a fine job of running off half our usual tourists/boaters and have put some of the local lake businesses in jepordy because of it. Can someone provide me an idea were the camping at the buttes is located. Not the state park but the reservoir. thank you. You CAN camp anywhere you want, but I would recommend camping at the main reservoir /boat ramp/ campground entrance (Twin Buttes Marina Park Dr.) off HWY67 just 3 miles outside of town passed the super WALMART. It is the road that appears on the MAP above right at the very top between UNIT 6 & 7 with the "Loop" on the end. Thats the camping area at the endalong the loop. That way you are very close to stores, food, supplies, Academy Sport, etc. Turn off Hwy at the Town & Country convenience store and Gas station. I wouldn't bother hunting around there though, unless you have a 4 wheeler and go WAY back in UNIT 6 along the far reaches of the river. Your gear will be safer there because of all the activity and traffic around there but it will be a waste of time hunting around all that noise. Unit 4 can be good and is close by the campground. My ranch is right next to that unit and I can give ya some pointers and where to look. Last edited by SanAngeloBowman; 11-26-2008 at 02:48 PM. Thanks for the information. I hunt on foot only. I like the excercise. I will be hunting unit 5 only and concentrating there. That way I can start to learn some patterns and maybe get lucky. I will be going out there Friday and stay until Sunday. Hey I work Friday, Unless I can get off in the AM. But i'm off Sat-Tues. this weekend. I wouldn't mind hangin' around there with ya if ya want some company. Across the hwy around the river in Unit 4 looks pretty good too. Send me your cell number and I'll call ya tomorrow so we can meet up. My ranch is about 2 miles from Unit5. Rob, Thank you again for the information about the unit. Too bad we could not meet up this weekend. Maybe next time. The places to hunt are really good, but from what I noticed they get a lot of presure in some areas. It was nice seeing that wide eight. Nothing came in within shooting rate, but at least we got to see some deer. hey everyone just joined the site . i noticed the info about the hunting in san angelo me and a friend went down there the 22-24 of nov and had no luck we were planning to go back but were looking for more info about all the places to hunt we had a map we got from a bait store showing all the areas but were interested in lV & V any help would be great. PM me sometime. Those are my areas around our lease. I heard quite a bit of shooting and seen some people take some deer this week. I've noticed a bit more movement with the cooler weather lately too. Hunt In: Irion ,Tom green co.
Now I know where your lease is . I know where all the big deer yall have seen are at......High fenced Breeder owns that property next to ya right? How many Big deer have you actually seen on your lease itself? I wouldn't hunt Public land if I had a lease if I was you....why do you? Just curious! I leased the property across from yours a few years "From the Mc Gowans" back behind Town&Country......some big deer for sure over there. Yep thats it! Been over on the Public Land a few times now because we had to turn our feeders of this week due to Cal's cows destroying our pens and running all the deer off ON TO the public land. The cows HAVE wandered off except one bull thats stuck around and we have noticed ALOT more deer coming back during the daylight hours. I ran into a HUGE buck walking back to my truck to get some more Gatorade before sitting down for the evening sit at around 4pm, dang! All times are GMT -5. The time now is 12:32 AM.